LEVEL5 and its instruments are compatible to the major European validation approaches and instruments such as EQF, ECVET and EUROPASS. They have been developed in the framework of a large number of Research and Development projects aiming at the improvement and mainstreaming of European Validation approaches. They deliver additional value to those systems e.g. in the validation of social, personal and Lifelong Learning key competences or in less fomalised learning projects or in learning o the job. LEVEL5 can be easily connected to other instruments like ProfilPASS or Youthpass. 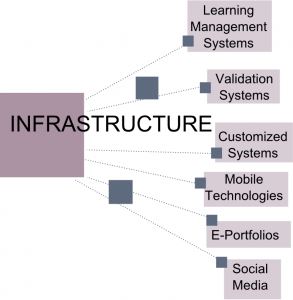 The LEVEL5 learning technologies are connected via LTI standards.